Oh, good question. Now that we’re officially recognizing the 200th anniversary of the War of 1812 and we’re well into the 150th anniversary of the Civil War, this is a great time to recognize that there were laws of war — treaties, statutes and orders regulating both the conduct of members of the military in the context of their military duties and in their actions when engaging the enemy. We’ll deal with the rules of engagement down the road; today let’s talk about the codes of conduct. Punishments for individual soldiers and sailors for violating the codes that governed their conduct covered a wide range — all the way from assigning extra duties to flogging to death. 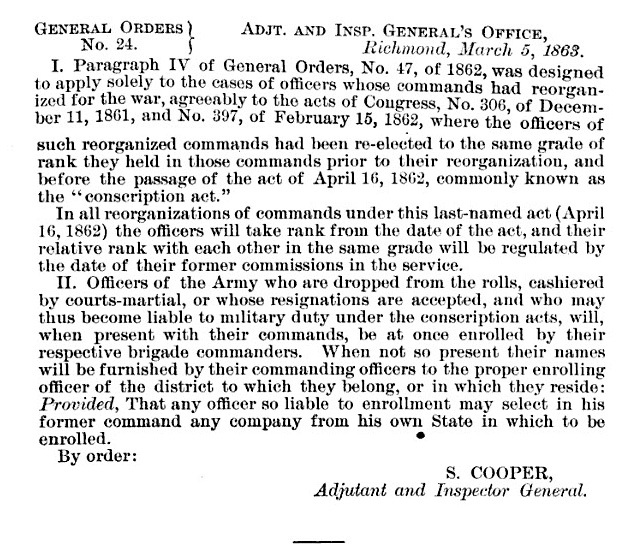 And one of those punishments — applicable to officers only — was to be “cashiered”: to be deprived of both rank and office.1 Men in lower ranks could also be demoted, but the word cashiered means more than just demotion — these officers lost their status as officers, and became virtual pariahs in the military establishment. 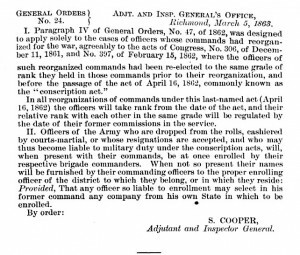 And that’s what happened here: this officer was stripped of his rank, stripped of his commission as an officer, and conscripted — drafted — into the ranks of the ordinary soldiers, most likely as a private to start with. Exactly what offense Karen’s officer committed isn’t shown in his compiled service record; she’d need to find a record of the court-martial in the official records of the Confederacy for that information. A request to the National Archives for his military records must specifically include a request for all court-martial records, and they’re likely to be in Record Group 109, War Department Collection of Confederate Records, Records of the Adjutant and Inspector General’s Department. Good luck — and let us know what you find out. Cool stuff, isn’t it? I had no idea there were so many things specified in such detail! These aspects of the law really are fascinating, Bill!